The site has a number of features which, according to local information, belong to a turn-of-the-century commercial operation to mine and process ochre. No primary historical information has so far been found for this site. The archaeological remains - burnt clay lumps, Chilean mill, drains, pits, dumps of ground ochre, and ochre mines (six shafts) - support the local interpretation for the site. The lack of diagnostic 1930s artefacts also helps place the site around the suggested date. 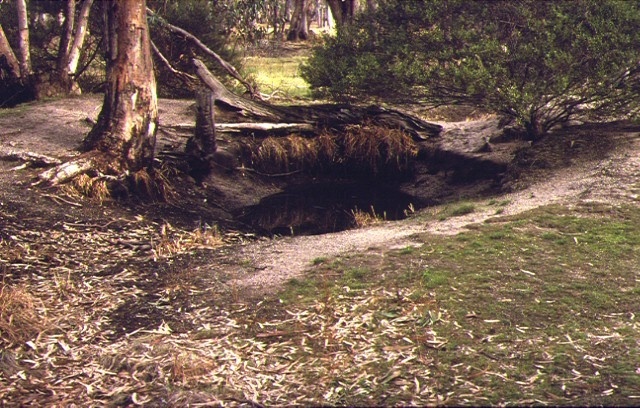 The Blind Creek Ochre Mine and Processing Site is of historical, archaeological and scientific importance to the State of Victoria. The Blind Creek Ochre Mine and Processing Site is historically and scientifically important as the State's only known example of a rare type of mining. The mineral processing plant is also a very rare artefact, being only one of small number of surviving example of Chilean mills in the State – three quarters of the others being at a historic gold mine at Costerfield and at the site of an early brickworks near Rushworth. The Blind Creek Ochre Mine and Processing Site is archaeologically important for its integrity and potential to yield artefacts on a hitherto unknown aspect of the State's post-settlement mining industry. Blind Creek Ochre Mine and Processing Site, Junction of Parsons and Old Kingower Roads, Kooyoora State Park, Loddon Shire Council. 1. All of the Crown land including the remnants of Ochre mines, Chilian mill, channels, pits, dumps and any archaeological objects and deposits within a radius of 250 metres of a point with Australian Map Grid co-ordinates E436 N480 on 1:100,000 map sheet number 7624 Dunolly. The land is part of Crown land parcel P123107.